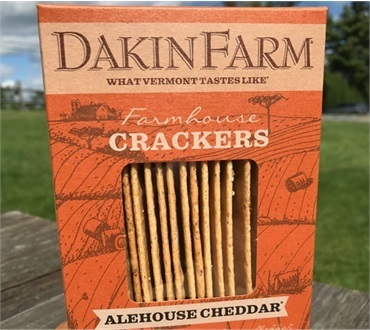 These beautiful crackers were crafted in a Vermont farmhouse based on an 1800, New England recipe. Today, they are baked fresh just down the road from Dakin Farm by Bristol Bakery using the same original Vermont recipe. Made with Cabot Creamery butter and other wholesome ingredients, they are the perfect complement to our amazing Vermont cheeses, smoked meats and so much more! The only cracker ever needed! These are seriously the best cracker ever! The smoky cheddar flavor that comes at the end is awesome!